Increasingly, renewables are the economically prudent way to source energy. A study found that installing wind power in the study area, during the 2000 to 2008 time period, increased the total county-level personal income by approximately $11,000 per megawatt. And the benefits do not end with financially uplifting the communities where the wind farm is installed; the companies investing in the project also reap multiple dividends. These benefits are part of the reason why corporate off-takers—and other direct retail purchasers—accounted for 52% of wind capacity contracted through PPAs in 2015. The benefits derived from renewable energy largely depend on the mechanism through which it is sourced. Companies can procure renewable energy through: on-site generation, renewable energy certificates (RECs), or power purchase agreements (PPAs). Some companies—examples include Intel, Unilever and Staples in 2014—achieve 100% green power through a mix of all the three. For many sustainability-minded consumers, the solar-panel glazed roof of Apple Park and the wind turbine outside method’s Chicago soap factory, hold a certain majesty about them. However, on-site generation is also charismatic to companies for a multitude of other reasons. Having the capacity installed on-site allows the company greatest control over the electricity generation—compared to other sourcing options. If the project is connected to the grid, the company may get a credit from the utility in case of over production. The extra energy that is fed into the system might even get valued at a special price (higher than conventional wholesale) known as a feed-in tariff. However, when the project under-performs, the company draws the remainder of its needed energy from the grid (utility). This arrangement reduces the need for a company to also install battery/energy-storage technology on site—further pushing down costs. What exactly is a PPA? The Power Purchase Agreement (PPA) is one of the most effective tools for sourcing renewable electricity—it is also the most complex. PPAs serve a particularly important role for Independent Power Producers (IPP)—who account for majority of renewables development. The DOE identifies revenue uncertainty as the greatest challenge for IPP developers; “lenders will not finance projects without a long-term PPA with a creditworthy counterparty.” PPAs help IPP developers to eliminate revenue risk from price uncertainty; it is a way for companies to contractually purchase electricity from a developer over the long term—typically 12-25 years. In a Physical PPA, the developer sells their energy output directly to a buyer(’offtaker’) at an agreed delivery point. The delivery point could be at a hub (centralized trading location), a busbar, or a node (both of which are typically at, or near, the project). At the point of delivery—where the seller delivers their energy into the grid—the offtaker gets ownership of the energy and associated attributes/benefits (see our last post) and is then responsible for transmitting it to wherever they intend to use it. This type of PPA has been utilized in situations where a concentrated facility/location uses a lot of energy, for example large data centers. However, despite the contract stipulating physical delivery of the energy, an Electrical Engineer would be hard-pressed to say if electrons generated by the project made it all the way to the buyer’s facility. What we do know however, is that the project feeds x amount of electricity into the grid and, ignoring transmission losses, the buyer gets x amount of energy at their facility. In part because you do not necessarily physically get that energy, many PPAs are now more of a financial agreement than a contract for physical delivery of energy; these are known as Virtual PPAs. 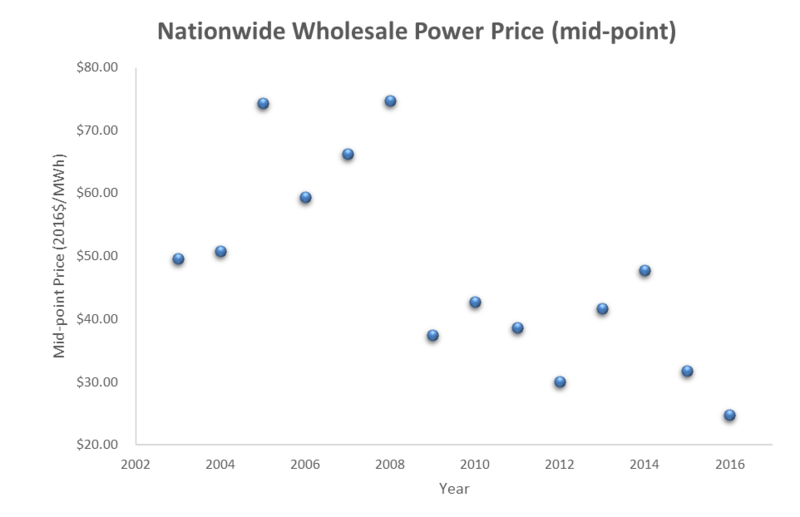 Often when developers sell energy into the wholesale market, they are paid a spot price (whatever the wholesale price is at the time, at the point of delivery; there might be a premium for renewables). However, there is uncertainty over future prices; as demonstrated in Figure 1 above. A Virtual PPA would help stabilize the price for the developer at an agreed point (say the IPP needs 4 cents/kWh). The company would pay—to the developer—the price difference if the spot price was lower (than 4 cents/kWh) and get paid the difference if the spot price was higher than the price agreed under the PPA. The predictable revenue stream increases a project’s attractiveness to lenders (and investors) and unlocks more—and often better—funding options for the project. For the developer, a PPA completely removes price risk and encourages them to develop new projects that would have been too risky otherwise. By eliminating this risk, PPAs effectively bring new renewable energy projects online. For a company, the logic of a PPA can be similar to that of a fuel hedge. According to Xcel Energy, this fuel hedge is even better because “the energy cost associated with it is less than you can do locking in a 20-year gas strip.” As noted by the World Economic Forum wind and solar power are the same price, or cheaper, than new fossil fuel capacity in over 30 countries; over the next two years, two thirds of the world should achieve grid parity. Nonetheless, like other price hedges, PPAs involve various complexities. For example, the company should be able to understand and forecast energy markets, as well as their own energy use, over a 10 to 20-year timeline. Done right, a PPA provides power price certainty over the long term. For companies which are making 15 to 20-year investment decisions, it helps to “lock in [their] costs over the same period”; especially for companies like Google where, “electricity is [the] number one operating expense after headcount.” In addition to the financial benefits, PPAs result in very strong causation claims that can significantly boost a company’s brand image. PPAs are well suited to companies with large energy consumption (over 100,000 MWh per year). On-site generation appears—at least based on current business models—best suited to business who own the real estate where the project is installed. In addition, net-metering rules within your state, if any, could significantly affect the economic feasibility. If your company can do an onsite project, or a PPA, then you should. However, for smaller companies, the above options might not be viable; instead, they procure Renewable Energy Certificates (RECs). Companies want their REC purchases to drive new projects; however, there is growing frustration that commodity RECs might not be achieving this goal. In the next, and final, installment of this series, we will explore RECs and other ways through which smaller-size companies can bring more renewable energy capacity online. Next StoryLet’s Talk Renewables: Okay, but what can we do?